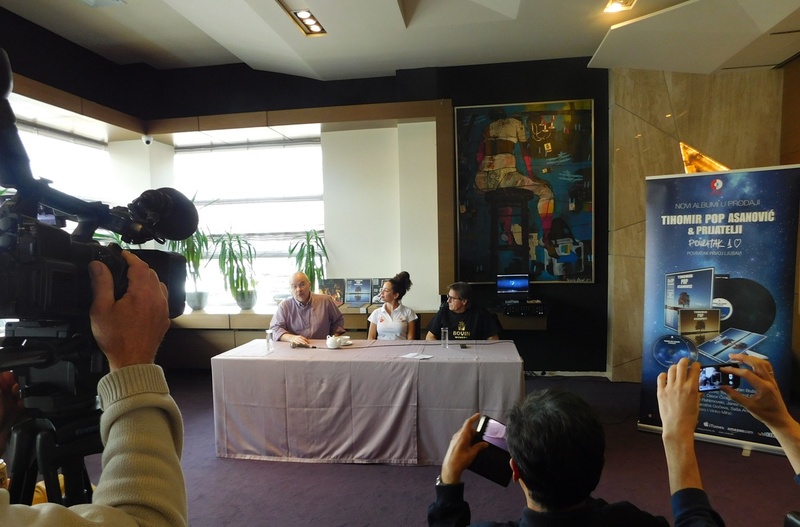 The legend of the ex Yu jazz and rock scene will perform with his band called “Tihomir Pop Asanovic, Sabrina Hebirs and Friends” at Nišville 2019 – it was confirmed at a press conference in Nis’s hotel My Place, where the new album “Povratak prvoj ljubavi” (Croatia Records) was released as a double CD but also on vynil (in Croatian and English) but also vinyl re-release of the two previous Asanovic’s albums (“Seven Days” and seven more “Mother Earth” and “Pop” also published for the “Jugoton” records “. Speaking off the new album, Tihomir Pop Asanovic and Sabrina Hebiri, who sang all the songs on the album, expressed their satisfaction that the new material in Serbia will be premiered – just on Nisville. Recalling that, with a fantastic permanent band consisting of predominantly young musicians, a lot of musicians from all over former Yugoslavia took part in the recording, which also earned a legendary status: Aki Rahimovski, Janez Bončina, Radomir Mihajlović Točak, Vedran Božić, Dragi Jelić, Vlatko Stefanovski, Jani Moder, Petar Grasic …. and announced that there will be several special guests in Nisville. Asking to recall his musical beginnings, Pop Asanovic said he was fortunate that in all the bands he played at the very beginning of his career he was the youngest and also the “weakest” musician. Tihomir Pop Asanovic, unconscious Hammond organ king, was born in Skopje, where he finished secondary music school and spent part of his childhood in Nis. He is one of the most prominent jazz, rock and pop instrumentalists or composers on the ex Yu scene. As a teenager, he played with various teams in European clubs and US military bases, then returned to Zagreb in 1968, founded the Generals group and played alongside the legendary jazz vibraphonist Boško Petrović. Thanks to these performances, the magazine “Jazz Podium” put him on the list of five best European organists. He was a member of the original Time band, and one of the founders of the cult jazz rock band “September”. He performed and recorded with many famous performers of various genres: from Tom Zdravkovic, through the composition “Pro Arte” to “Yu group”, “Smaka” and Josipa Lisac (on the cult album “The Diary of One Love”). In the mid-seventies he released two solo albums “Mother Earth” (1974) and “Pop” (1976), which are still considered today as the best performances on the Yugoslav progressive and jazz rock scene. These albums include Josipa Lisac, Nada Žgur, Doca Marlot, Dado Topič, Janez Bončina, Dragi Jelič, Mario Mavrin, Ratko Divjak, Pero Ugrin, Braco Doblekar, Zdenka Kovačiček, Miljernko Prohaska … and some of the leading Zagreb Jazz Musicians. He led the “Yugoslav Pop Selection”, also composed of the best instrumentalists. He had the opportunity to meet and / or mingle with many famous jazz, pop, soul performers including Dizzy Gilespie, Art Farmer, Quncy Jones, Slide Hampton, Ray Charles, Frank Zappa, Frank Sinatra, Michael Jackson …. After decades spent in USA where he mainly engaged in trading instruments, Tihomir Pop Asanovic returned to Zagreb and slowly but surely began to return to playing in full form – from which he obviously did not even go out in the years of inactivity! As it was sometimes during the 1970s, he managed to bring together the best ex Yu musicians on his projects (which did not go hand-in-hand before) and create great music – he also set up a new “homework” album “Return of the First Love” “. As the critics say, but also the first reactions of the audience – this “return” was worth waiting for four and a half decades!